My youngest son never fails to be a great model! Here he’s showing us how well Griffin’s KaZoo MyPhones headphones fit him. Photo: Patricia Vollmer. We had a chance to review Griffin Technology’s latest kids’ headphones that were just released last week. Called MyPhones, these headphones are part of their KaZoo line of kids’ products. The bright colors and adorable animal themes make them fun for the kids. The volume-limiting sound and reasonable price will make it fun for the parents to buy for the kids. 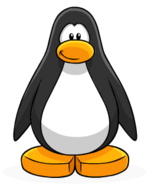 As of right now, the headphones come in frog and penguin models, and I have to say, the penguin looks quite a bit like the Club Penguin mascot. The headphones are chunky in size — good for little hands to grasp — yet are lightweight. The frog faces on the side are molded plastic, and the eyes are white-colored plastic with scratch-resistant pupils painted on it. The plug end has a fly molded on it (or a fish molded onto the penguin model), how cute is that? The over-the-ear design, along with the 85-decibel output limit makes it safer for young ears. The cushioned earpieces are well-adhered to the headphones, unlike other headphones we’ve reviewed where the soft earpieces can fall off and are difficult for the kids to re-attach. An extreme closeup to the molded plastic fly that makes it easy for a child to grasp and plug into a device. Photo: Patricia Vollmer. The headphones are adjustable enough that even I could wear them comfortably — and I don’t have the smallest head in the world. Both of my sons found the fit comfortable. I recommend the Griffin KaZoo MyPhones for any family with young children who need to play with their devices quietly and parents who are concerned about safe headphone listening practices. Griffin Technology’s KaZoo MyPhones are part of their KaZoo line of kid-friendly tech accessories. They retail for $19.99 and come in frog and penguin shapes. They can be purchased through Griffin’s online store, or at other popular retailers that carry Griffin Technology products, such as Amazon, Best Buy, Target and Staples.